The Arthritis Research Centre of Canada (ARC) scientists have discovered that some people with inflammatory arthritis may die as much as a decade earlier than those who don’t have arthritis. The researchers are studying ways of preventing early death in inflammatory arthritis. If you have any of these types of arthritis, you should be aware of the increased risk of dying early from heart and blood vessel problems. There are ways to reduce your risk with proper risk assessment screening, lifestyle changes and treatment of underlying causes. 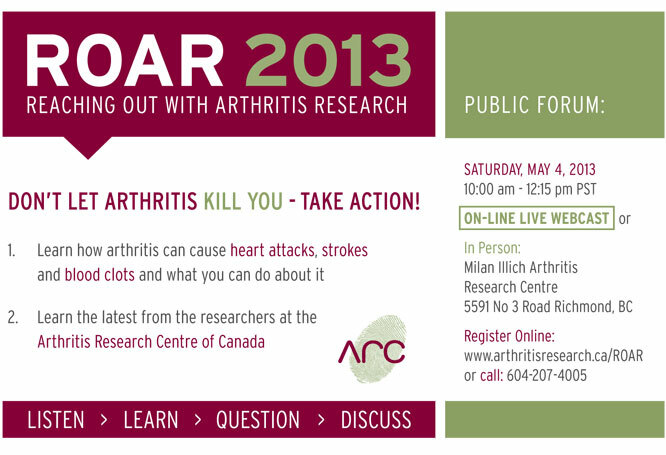 Don’t Let Your Arthritis Kill You - Take Action! Please join us in person or online from the comfort of your own home on Saturday, May 4, 2013. Simple online instructions on how to connect to the webcast are available. For more information click here.